Holy canoli people. 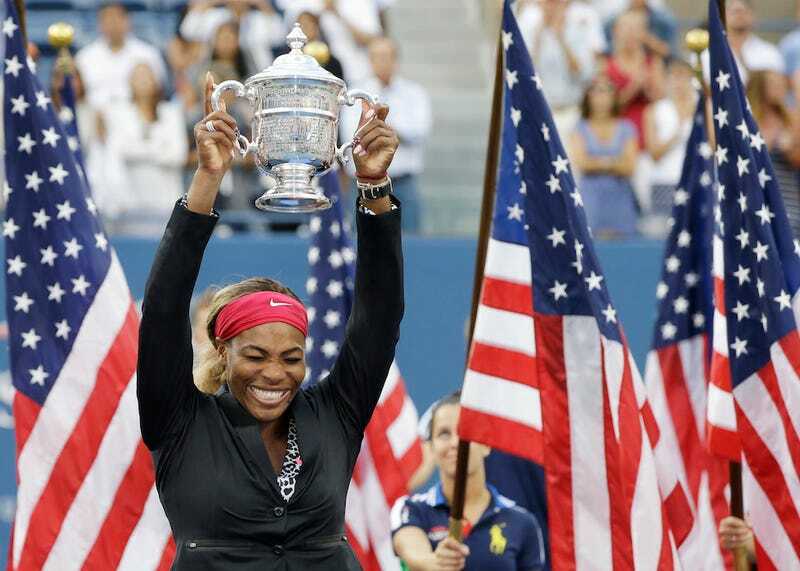 Last night Serena Williams won the US Open for the third time in a row. It's her sixth overall win, her 18th Grand slam title (surpassing Roger Federer), and she's about to get a record amount of prize money for tennis athletes—to the tune of $4 million. The U.S. Open summary describes her dominance heading into the match: "she's won 80 percent of her first serve points, gotten in 76 percent of her returns and broken her opponents 29 times while losing her serve on just six occasions." "I have been trying to reach it for so long, since last year, well, since the beginning of the year," said Williams, who received an 18-karat gold bracelet from Evert and Navratilova after the match. "I didn't really think I would get there. I just felt so good." I bet it did. Also, check out this adorable pic Robin Roberts just tweeted from 1999, after a 17-year-old Serena won her first US Open.